This article is about the Roman Catholic Church organizations, the magazine, and the hill in New York. For the Australian town, see Maryknoll, Victoria. "To those who love God all things work together for good." Maryknoll is a name shared by three organizations (two religious institutes and one lay ministry) that are part of the Roman Catholic Church: Maryknoll Fathers and Brothers (Catholic Foreign Mission Society of America; Maryknoll Society), Maryknoll Sisters (Maryknoll Sisters of St. Dominic), and Maryknoll Lay Missioners. The organizations are independent entities with shared history that work closely together in the joint focus of the overseas mission activity of the Catholic Church particularly in East Asia, China, Japan, Korea, Latin America and Africa. The organizations officially began in 1911, founded by Thomas Frederick Price, James Anthony Walsh, and Mary Joseph Rogers. The name Maryknoll comes from the hill outside the Village of Ossining, Westchester County, New York, which houses the headquarters of all three. Members of the societies are usually called Maryknollers. Maryknollers are sometimes known as the "Marines of the Catholic Church" for their reputation of moving into rough areas, living side-by-side with the indigenous peoples and learning the language. Maryknollers focus on "combating poverty, providing healthcare, building communities and advancing peace and social justice" in the countries they serve and have built numerous orphanages, primary schools and secondary schools. Because of the way in which Maryknollers have especially engaged in social justice, Maryknoll is also sometimes seen as a movement that represents missionary service concerned with positive action for indigenous people. In the mid-20th century, this movement came to be associated with Liberation theology. The Christophers and The Maryknoll Affiliates are both associated with the Maryknoll Movement. Maryknoll is also the current name of the semi-monthly magazine which the Maryknoll Fathers & Brothers publish. Prior to 1906, the United States was on a roster of Catholic mission territories compiled by the Vatican. It was part of an era of heavy migrations of European Catholics to the United States and there was a cultural hostility to Roman Catholicism. The establishment of Maryknoll for foreign missions came at a time when the Catholic church was focussing its energies on that anti-Catholic bias within the United States. "Out of the 17,000 Americans serving as Catholic priests at the time, for example, the number serving in foreign missions was 14." Fathers Thomas F. Price, seated at left, and James A. Walsh, seated at center, co-founders of the Maryknoll Fathers and Brothers, pose for a photo with fellow Maryknoll Fathers James E. Walsh, seated at right, Francis X. Ford, standing at left, and Bernard Meyer, at Maryknoll, N.Y., in 1918. In 1907, Father James Walsh of Boston began publishing The Field Afar, a mission magazine that would later become Maryknoll. The following year, Mary "Mollie" Josephine Rogers (later Mother Mary Joseph, MM) began helping Walsh with editing, translating and writing. In 1910, Father Thomas Price was facing the failure of his attempt to begin a Catholic order for domestic mission work in the South. Price was overwhelmed with fundraising on top of his actual mission work and the many responsibilities he had as the order Superior. Price and Walsh had corresponded and met in person that year at a conference in Montreal. The pair immediately began planning a national foreign mission seminary. They were complementary in character; Walsh had a knack for organization and planning things on a grand scale while Price was a "Tarheel" from North Carolina who was personable and charismatic. The two received permission to travel to Rome, where Pope Pius X granted their request to found a new society on June 29, 1911. Founder Mary Josephine Rogers, second from right in the front row, with the first 'Teresians' - front row: Mary Louise Wholean, Anna Maria Towle, Sara Sullivan; Back Row: Mary Augustine Dwyer, Nora Shea, Margaret Shea, at Maryknoll in 1913. Walsh immediately put an ad in The Field Afar; "Youths or young men who feel a strong desire to toil for the souls of heathen people and who are willing to go afar with no hope of earthly recompense and with no guarantee of a return to their native land are encouraged to write.” In 1912, The Catholic Foreign Mission Society of America (CFMSA) was launched in a rented property Hawthorne, NY with a total of six men. Thomas McCann was the first candidate to become a full Brother member of the Maryknoll Society on Nov. 21, 1912. That September, Rogers had relocated to New York to continue work on the magazine. She and five other women "secretaries" began living together at Hawthorne. Rogers emerged as their natural leader and envisioned the women as missioners in their own right and not merely serving in supportive roles to the men. Walsh and Price had immediately begun a search for a permanent home for their new society. They contracted for a parcel in Pocantico Hills in July, 1912 but John D. Rockefeller, who owned the property on the other side and did not want a seminary as a neighbor, contested the purchase in court. In August, CFMSA gave up the parcel in return for a financial arrangement. Walsh and Price found a 93-acre hill in Ossining that included three houses and a barn and was now affordable due to the Rockefeller windfall. Wary of another incident of bias, Rogers, dressed as a "Lady from Boston" and accompanied by a lawyer, negotiated the sale. Walsh, dressed as her chauffeur, waited for two hours with the car. They made the purchase on August 20, 1912 for $44,500, a lower price than what had been offered for the previous parcel. Price dedicated the property to the Blessed Virgin Mary and the name "Mary's Knoll" was coined. The hilltop had two homesteads at a distance from each other, the larger one became the first Seminary and the other was set aside for the "secretaries". A carriage house with quarters was converted into the chapel. The barn was allocated to the Brothers and seminary students. On October 15, 1912, the women joined Rogers, who had moved to Maryknoll directly after the purchase to cook and help organize. They dubbed their building at Maryknoll "St. Teresa's Lodge". A postcard from a traveling priest in England was addressed to them as the Teresians, and the nickname stuck. The Teresians began studying with the Scranton Sisters of the Immaculate Heart of Mary as they planned to petition for official recognition from Rome. They designed uniforms with the Chi Rho symbol but rarely wore them and, under the advice of a retreat leader, used the Missal for their prayers - a rare occurrence among women at that time. Maryknoll now had nine men serving as Brothers in addition to McCann. They named their building at Maryknoll "St. Michael's" Residence and themselves "The Brothers of St. Michael". Like the Teresians, most Brothers spent much of those early years building, maintaining and updating the buildings at Maryknoll. Michael Hoban, bishop of Scranton, PA, invited Maryknoll to establish a school in the city. In 1913, Maryknoll Preparatory Seminary was founded on Clay Avenue and students attended classes at St. Thomas College. Raymond Lane, who made his profession that year in the inaugural class, wrote that the success of the venture was greatly due to residents of Scranton who supported the new seminary with meals, transportation, and donations. In 1915 the lease expired and the students joined the community outside Ossining for a year. In 1916, Walsh, after some difficulty, acquired 179 acres in Clarks Summit, PA and a school set up in an old farm house on the property. It became known as the Venard for Théophane Vénard. Price took charge of the Venard its first year, taking one of the Teresians to assist the new community. World War I ended in 1918 and three Maryknoll priests were ready to make the first Maryknoll mission to China. James Edward Walsh, Francis X. Ford, and Bernard F. Meyer along with Price as Mission Superior departed for China on September 8, 1918. Father Price liked China equally with us, but he had one enthusiasm only... all those precious souls that make up the vast population of common people that we went to help and to save. He gave this emphasis in a way that was very simple and yet highly important, and that was by taking very seriously every little piece of work that was done for the people – the simplest service in the Church, even though it should be attended by only a handful, the insistence on a complete schedule of church services for them just as if he had been in the biggest parish in his own country; the immediate planning for whatever they needed in the matter of religious, educational, medical and other help, even though plans could not be immediately realized, the most patient and courteous reception for every visitor; the scrupulous visits to the outlying villages, even though some of them contained only a few apparently hopeless apostates; and, in general, the placing of himself, his mission and all his energies and resources at the complete service of the people. In short, Father Price knew why he went to China, and if we did not know it, we soon learned it from his example. I think this emphasis has persisted throughout the development of our missions, and I believe that his short and sacrificial mission career was a providential means in bringing this about. Father Thomas F. Price, co-founder of the Maryknoll Fathers and Brothers, center, was pictured in a 1918 photo in China. Daniel Leo McShane led the second Departure Group in 1919. McShanes’s first assignment was to assist Meyer. When the Maryknollers arrived, they discovered that Chinese orphanages did not accept infants or sick children. An orphanage was begun in Yeungkong and in 1920. McShane was then sent to be the pastor of Luoding and immediately set up an orphanage for abandoned children there, as well, despite local opposition. The abandoned babies were almost all female and traditionally drowned before the Maryknollers built facilities and began offering a few cents for every child. Soon the Yeungkong orphanage was averaging 450 baptisms a year and the Luoding facility close to a thousand. In August 1919, Price became seriously ill. With no adequate medical facilities in the area, he was transported to St. Paul's Hospital, Hong Kong. It was a long and arduous journey from Yeungkong by primitive means. Admitted on August 19, 1919. Price underwent an operation in early September. The treatment was too late and Price died as a result of a burst appendix on September 12, 1919. His body was buried in the priests’ plot in St. Michael’s Cemetery in Happy Valley, Hong Kong. In 1936, his body was exhumed and transferred to the cemetery at Maryknoll, New York. James E Walsh was named Superior of the mission following Price's death. In 1914 one of the Teresians earliest benefactors, Julia Ward, took Rogers to Europe. They visited Our Lady of Lourdes in France and Vatican City. This was Roger's first experience of the European Catholic approach religious congregation devoted specifically to foreign mission work. Having only been exposed to Protestant missionary attitudes at Smith College, Rogers had patterned the Teresians on that model: active, practical, and pious. This was in sharp contrast to the first group of Sisters went to Los Angeles and Seattle in 1914 to work with Japanese children. Rogers was taken to Europe, with a special stop in Rome, by early patron Julia Ward. A mission to Korea, begun in 1922, had also grown significantly by 1927, to 17 priests and two Brothers. It was centered in the north of Korea, around the city of Pyongyang. The early missionaries concentrated in East Asia, particularly China and Korea. During WW2, however, numerous South American countries were added as mission sites. 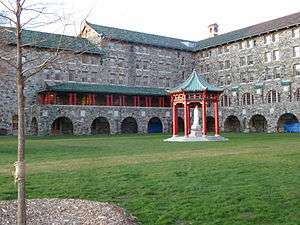 The Asian-inspired fieldstone seminary at Maryknoll, a hill on the outskirts of Ossining, N.Y. Designed by Maginnis & Walsh. As of 2008, there are over 475 Maryknoll priests and Brothers serving in countries around the world, principally in Africa, Asia and Latin America. Throughout their history, especially in the first half of the 20th century, Maryknoll missioners played a large role in the Catholic Church in East Asia where some missioners still work. Maryknoll also has extensive connections with many Latin American countries, where it has long worked to help alleviate poverty and bring constructive changes to the life of Latin America's poor. 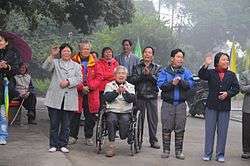 Residents at Gate of Heaven Leprosarium in Kongmoon 厓門倉山 Many of the buildings there erected by Bro Albert Staubli are still standing today. Photo taken on 2011 March 20. Patrick Joseph Byrne, Apostolic Delegate to Korea from 1949 to 1950 who died in the custody of the Communists in Korea. Thomas Frederick Price, one of the two Maryknoll founders. 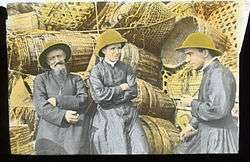 Fr Price was one of the first four Maryknollers to arrive in China in 1918. Price Memorial Catholic Primary School was founded in Hong Kong for the his labour in missionary work. Everett Francis Briggs, Maryknoll missionary, studied the history of the Monongah Mining Disaster of December 6, 1907 described as "the worst mining disaster in American History". After discovering there was no memorial, he sought to ensure that the victims of the tragedy were not forgotten. Roy Bourgeois was ordained to the priesthood in the Maryknoll Fathers and Brothers in 1972, after which he worked with the poor in Bolivia until 1975. An outspoken critic of US foreign policy in Latin America, he founded the non-profit human rights organization, School of the Americas Watch (SOA Watch) in 1990. In 2005 he was awarded the Thomas Merton Award for his work. Following his participation in a women's ordination-to-the-priesthood ceremony in August 2008, he was warned of possible excommunication latae sententiae, marking the beginning of a four-year-long period of discussion and negotiation between Bourgeois and the Church, through the Maryknoll Society. 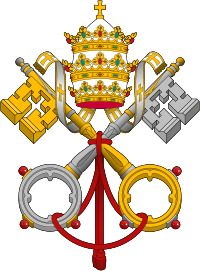 Finally, on November 19, 2012, it was announced that Bourgeois had been officially canonically dismissed from both the Maryknoll Society, and the Roman Catholic priesthood, effective October 4, 2012. Fr. Vincent Robert Capodanno former Maryknoll missionary, Servant of God, and Medal of Honor winner during the Viet Nam War as a Navy Chaplain attached to the US Marines. He did his missionary work in Taiwan. Fr. Joseph G. Healey serves in Kenya. He is noted for his innovative use of proverbs and other local verbal arts in ministry. Several notable schools in Hong Kong were founded by Maryknollers; and several are still run by them. Marymount Secondary School initially known as the Holy Spirit School, then the Maryknoll Sisters’ School, a secondary school for girls founded in 1927. This is the very second school set up by Maryknollers in Hong Kong. Maryknoll Convent School, primary and secondary school for girls. The last three schools were in fact founded by the Maryknoll Sisters of St. Dominic, commonly just known as the Maryknoll Sisters. Maryknoll Convent School is still managed by them in Hong Kong. However, sponsorship of the two Marymount schools was transferred to Christian Life Community. Nevertheless, these three schools are frequently viewed as members of the Maryknoll family in Hong Kong. Bishop Paschang Catholic School, formerly known as Bishop Paschang Memorial School, a co-educational primary school. This school was founded after the late Maryknoller, Bishop Adolph John Paschang, who had suffered a lot for his missionary work in China. 1 2 3 Rogers, Mary (February 20, 1920). The Teresians of Maryknoll. The Field Afar, Maryknoll. p. 319. Retrieved 9 June 2014. 1 2 3 deChillo, Suzanne (March 31, 1985). "Maryknoll Pursues Its Vision of Mission". The New York Times. Retrieved 15 June 2014. Located across the road from each other, the Maryknoll Sisters of St. Domenic, as they are officially called, and the Maryknoll Society - which is officially known as the Catholic Foreign Mission Society of America and includes priests, brothers and lay missionaries - are separate organizations but often cooperate on projects. Their work in 27 countries - in churches, schools and orphanages and with lepers, factory workers, farmers and the homeless - rarely makes the headlines. Founded in 1911, the Maryknoll Society was the first Catholic Church missionary society in the United States; up until then the United States was considered mission territory. The members of the society quickly became known as the Marines of the Church. 1 2 3 KASHUBA, Cheryl (October 12, 2012). "Local History: Maryknoll Fathers trace roots to Hill Section". Scranton, PA: The Scranton Times-Tribune. Retrieved 8 June 2014. The Catholic Foreign Mission Society of America, commonly known as the Maryknoll Fathers, was in its infancy. In 1911, deeply convinced of the need to train Catholic priests for foreign missions, Father Thomas Price, a native of North Carolina, and Father James Walsh of Boston received permission to travel to Rome, where Pope Pius X granted their request to found their new society. The following year, 1912, the Maryknoll Fathers opened their first major seminary at Maryknoll, a hill on the outskirts of Ossining, N.Y., dedicated to Mary, Mother of God. In 1913, the Most Rev. Michael J. Hoban, bishop of Scranton, invited the society to establish a school in the city. 1 2 Price, Thomas (October 1917). "The Pioneer's Log, Fr. Superior's Knolligram". The Field Afar. 11: 151–152. Retrieved 10 June 2014. ↑ Fraser, Barbara J. (September 28, 2011). "The church's Marines: Maryknollers older, fewer, but still going strong". Catholic News Service. Catholic News Service. Retrieved 15 June 2014. ↑ "Maryknoll Fathers and Brothers". The Maryknoll Society. Retrieved 15 June 2014. ↑ "Maryknoll Lay Missioners - Our Mission". Maryknoll Lay Missioners. Retrieved 11 June 2014. ↑ Powers, George C. (1926). The Maryknoll movement (1st US ed.). Catholic foreign mission society of America. Retrieved 11 June 2014. ↑ "The Maryknoll Affiliates". Retrieved 11 June 2014. ↑ "Maryknoll Magazine". Maryknoll Magazine/. Maryknoll. Retrieved 12 June 2014. 1 2 3 Yik-yi Chu, Cindy (2007). Maryknoll sisters in Hong Kong, 1921-1969 : in love with the chinese. [S.l. ]: Palgrave Macmillan. p. 15. ISBN 0230602312. Retrieved 11 June 2014. 1 2 Keane, James T. (June 20, 2011). Outward Bound. America Press Inc.,: AMERICA: The National Catholic Review. Retrieved 11 June 2014. A century ago, an attentive subscriber to the Catholic mission magazine The Field Afar might have noticed the following announcement in its pages: “Youths or young men who feel a strong desire to toil for the souls of heathen people and who are willing to go afar with no hope of earthly recompense and with no guarantee of a return to their native land are encouraged to write, making their letter personal, to the Editor of Field Afar.” That year, 1911, was far from the heyday of American Catholic missionary enterprises; rather, the editor, James A. Walsh, M.M., was addressing readers in the United States, whose church had been removed from the Vatican’s roster of mission territories only three years before and for whom the notion of sending missionaries abroad was a foreign one indeed. In the words of the historian Msgr. John Tracy Ellis, the first decade of the 20th century was a time when the Catholic Church in the United States finally “attained ecclesiastical adulthood.” The great migrations of European Catholics to the United States were ongoing, and Catholics were trying to take root in a culture more or less hostile to “popery.” As a result, the energies of the institutional church were often directed inward. Out of the 17,000 Americans serving as Catholic priests at the time, for example, the number serving in foreign missions was 14. 1 2 LaVerdiere, Claudette (2011). On the threshold of the future : the life and spirituality of Mother Mary Joseph Rogers, founder of the Maryknoll Sisters. Maryknoll, N.Y.: Orbis Books. ISBN 1570759421. ↑ Marie, Andre (June 30, 2011). [Back to the Roots: Examining Maryknoll's Heroic Beginnings "The Evangelical Vision of Father Thomas Fredrick Price"] Check |url= value (help). Catholic Online. Catholic Online. Retrieved 11 June 2014. ↑ "Maryknoll priests visit grave of Fr. Thomas F. Price in Hong Kong, China, 1923.". Retrieved 2011-05-14. 1 2 3 Moorman, Dennis. "Cherishing Maryknoll's History - as we reach 100 years". The Maryknoll Society. Retrieved 9 June 2014. 1 2 3 "Maryknoll History". Maryknoll Vocations. Copyright © 2014 Maryknoll Missionary Vocations. All Rights Reserved. P.O. Box 305, Maryknoll, NY 10545-0305. Retrieved 9 June 2014. 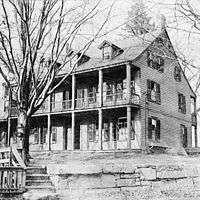 In 1912 the young missionary Society established their headquarters on a hilltop farm above Ossining, N.Y. The founders dedicated the hill, or knoll, to the Blessed Virgin. Thus, Mary’s Knoll was born. In 1918 Maryknoll sent its first members to China , including Father Price, who died the following year. Three years later, six Maryknoll Sisters sent their first missioners to South China . The mission soon expanded to include northern China and Korea . "Be forever bigger than your Society," Walsh, now a bishop, urged his spiritual sons. The Society did not hesitate to try new approaches to attract and include as many people as possible. Before it had its first seminarian, one young man applied who felt called to mission but not priesthood. Thomas McCann became the first Maryknoll Brother in 1912. ↑ Whitehead, Kate (11 March 2014). Documentary on the Maryknoll nuns sets its director on new path. South China Morning Post. Retrieved 9 June 2014. In 1912, the Maryknoll Sisters were the first group of Catholic nuns in the United States to found an overseas mission. When six sisters arrived in Hong Kong 10 years later, they had few resources at their disposal aside from their faith, determination to succeed and brains - what comes across clearly through the documentary is that these women, who travelled all over the world, were very well educated. ↑ Tang, Nancy. "Brief History of the Maryknoll Sisters". Trailblazers in Habits. Fishtailsoup Productions Inc. Retrieved 9 June 2014. In 1912, the Maryknoll Sisters were the first group of Catholic Sisters in the United States founded for overseas mission. Ten years later in 1922, a group of six Sisters in sweeping grey habits arrived by steamer in Hong Kong to begin their mission. They had few resources other than their own faith, dedication, and what can only be described as a divinely-inspired ingenuity. Over the next nine decades, the Maryknoll Sisters established six thriving schools and a hospital in Hong Kong, and basically laid the foundation for Hong Kong’s social welfare system. 1 2 Maryknoll Society Website. 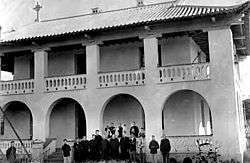 "The History of Maryknoll's Seminary Building". Maryknoll. Maryknoll Society. Retrieved 9 June 2014. A larger facility was required and the Boston architectural firm of Maginnis and Walsh (Timothy Walsh was the brother of Father Walsh) was commissioned to design the Seminary Building that today dominates the grounds. ↑ Armstrong, Richard (1984). Out to change the world : a life of Father James Keller of the Christophers. New York: Crossroad. ISBN 0824506510. ↑ Jones, Penny Lernoux ; with Arthur; Ellsberg, Robert (2012). Hearts on fire : the story of the Maryknoll Sisters (Centenary ed.). Maryknoll, N.Y.: Orbis Books. p. 31. ISBN 978-1570759345. ↑ Marie, Jeanne. Maryknoll's first lady. New York, NY: Dodd Publishers. p. 327. 1 2 3 "Mollie's Legacy of Love Summer - 2012". Maryknoll Affiliates. Maryknoll. Summer 1912. Retrieved 11 June 2014. On September 14, Father Walsh wrote to Mary Louise, Sara, Mary Augustine, and Nora asking: “Do you wish Mollie to direct you, i.e., under my direction?… Write me on this subject…” The diary notes: “Before the day was over, we had all written to Father in reply to a note he had sent us this noon, and each had said “yes.” Father was too busy to give us a conference, but sent us a note in which he told us that Mary Joseph (Mollie) was to be head of the household until the Feast of the Epiphany 1913. Mollie’s Accepting the Role of Directress The Secretaries found themselves moved deeply when Mollie expressed her appreciation of them and accepted her responsibility with these words: “I want you to know how wholly I belong to you in every hour of the day and night, to serve you, to love you, to watch over you and with you, under the guidance of the Holy Spirit, for of myself I can do nothing. Through Father Walsh and you I offer to this work the service of my entire being.” It was providential that just two years previously on September 15, 1910, Mollie had made a formal resolve to devote herself to mission work! Mollie, Cook at the Seminary On September 18, 1912, the Fathers, Students and Brothers moved from Hawthorne to Maryknoll, as Father Walsh was already calling his farm on the hill above Ossining. After a period of straightening up and settling down, which Father Walsh crisply defined as “chaos,” and just as things were becoming normal, they woke up one morning to find that their cook had departed and left them breakfastless. Father Walsh had only to tell Mollie what had happened. After consulting the secretaries, she set out immediately for Maryknoll from Hawthorne. Hannah, who had been cooking for the secretaries, joined Mollie the following day, and together they turned out three robust meals a day, with occasional evidence of Mollie’s special touches. They also cleaned all the pots and pans, stocked the empty shelves, met the usual situations of unexpected guests, late and early dinners, and the lack or delay of supplies! They slept in the old farmhouse down the hill from the seminary ~ later St. Teresa’s Lodge. ↑ Lane, Raymond (January 1961). The Early Days of Maryknoll. Literary Licensing, LLC (May 5, 2012). p. 310. ISBN 1258327260. Retrieved 9 June 2014. 1 2 Wiest, Jean-Paul (1988). Maryknoll in China : a history, 1918-1955 (Paperback ed.). Armonk, N.Y.: M.E. Sharpe. ISBN 0873324188. ↑ Ruiz, Emily C. "Maryknoll's First Seminarian - Bishop Francis X. Ford". The Maryknoll Society. Maryknoll Archives. Retrieved 15 June 2014. ↑ Young, Ernest P. (2013). Ecclesiastical colony : China's Catholic Church and the French religious protectorate. New York: Oxford University Press. pp. 175–177. ISBN 9780199924622. ↑ Sheridan, Fr. Robert E. (1956). Symposium on Father Price (PDF). http://www.maryknollbrothers.org/Brothers_History.pdf: Marknoll Fathers & Brothers. Retrieved 15 June 2014. ↑ Walsh, James Edwward (1947). The Man on Joss Stick Alley. [The biography of Father Daniel L. McShane. With plates, including a portrait.] New York, Toronto: Longmans, Green & Co. p. 146. ASIN B0006AR8A4. 1 2 Mungello, D.E. (2008). Drowning girls in China : female infanticide in China since 1650. Lanham, MD [etc. ]: Rowman & Littlefield. p. 117. ISBN 0742555313. ↑ "About Us". Maryknoll Sisters. Retrieved April 12, 2012. 1 2 "A Brief History -- The sending of missioners from the U.S. Church was seen as a sign of the U.S. Catholic Church finally coming of age.". Retrieved 2011-05-01. ↑ Jean-Paul WIEST (1988). 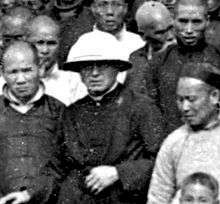 Maryknoll In China – A history, 1918 -- 1955. M.E. Sharpe Inc, Armonk, NY. ISBN 0-87332-418-8. ↑ "Bishop Ford Memorial School official web page". Retrieved 2011-04-30. ↑ "Thomas Frederick Price -- A devout Catholic in the tar heel state of North Carolina, Rev. Thomas Frederick Price found a natural calling to share his faith in the midst of antipathy.". Retrieved 2011-05-01. ↑ "Rev. James E. Walsh M.M." (PDF). Retrieved 2011-05-14. 1 2 "Bishop Walsh Primary School official web page". Retrieved 2011-04-30. ↑ "Bishop Paschang Catholic School official web page". Retrieved 2011-04-28. ↑ Sadowski, Dennis (19 November 2012). "Maryknoller dismissed from priesthood for supporting women's ordination". Catholic News Service. Retrieved 21 November 2012. ↑ "Fr. Paschang and graduating class at Gaozhou, China, 1926". Retrieved 2011-05-01. Wikimedia Commons has media related to Maryknoll.